Register now for the September 2018 course! Mandatory Cosmetology Entrance Exam. See catalog for dates. Please notify us if you are a One-Stop client as you would be exempted from having to take the entrance test. Current high school seniors graduating in June 2018 are also exempted from having to take the entrance test. 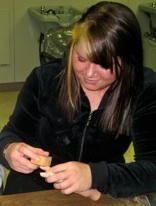 The Adult Cosmetology and Hairstyling program is offered to high-school graduates. The course meets the 1,000 hour requirement to take the licensing examinations given by the State Board of Hairstyling and Cosmetology. Each year applications for the program begin in January and a Basic Skills test is given in June for the following September's class. The cost of the Basic Skills test is $20. The tuition for the 2018-19class is $7,000. The cost of uniforms and licensure are approximately $100 Financial aid is available. An average student will take a $7,100 student or personal loan. A payment plan is also available. Two payments of $3,300 due on September 1 and January 1.